There are important moments you remember all your life like graduating from college or proposing marriage. New police college grad Constable Erik Meechan experienced both on the same day. At the graduation ceremony of Wing 315 in Hawke’s Bay, New Zealand, the class of 78 new police officers marked the end of their initial training with a rousing haka. But there was one more task for Meechan. He asked if his boyfriend of five years, Matty Judd, would please step forward. 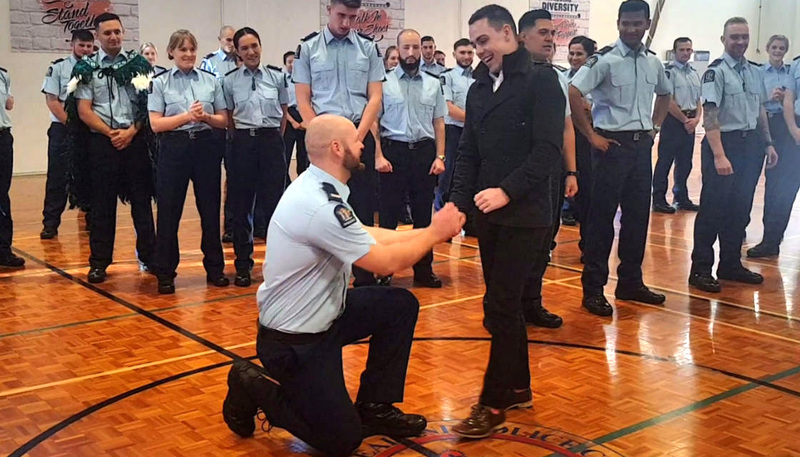 As Judd emerged from the audience, the constable dropped to one knee and asked Judd to marry him. The happy news is Judd said ‘yes’ and the crowd roared their approval. Meechan later told the New Zealand Herald he had mulled over the proposal for a month but didn’t decide to pop the question for sure until just days before. “I wasn’t 100 per cent sure until a couple days out. We actually got his ring customised and that arrived the day before so it was cutting it pretty fine,” he said. “It was a really good time and place, and also it’s quite rare to get all our family together in the same place, so it was good to get them all together,” he added. Commissioner Mike Bush, who attended the ceremony, was one of the first to congratulate the happy couple. He also expressed pride at how his police department has embraced the diversity of modern New Zealand. “I wish Eric and Matty all the very best for the future,” he added. Watch the happy moment below.